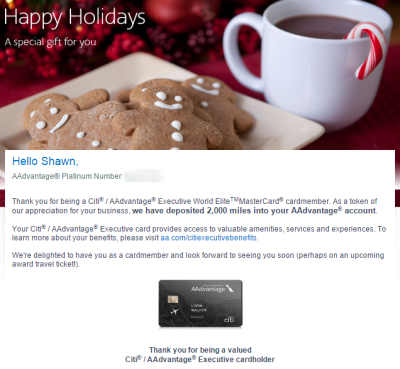 Citi AAdvantage Executive Cardholder? Get 2,000 Free Miles! Airline News & Info American Airlines Citi AAdvantage Executive Card Holder? How About 2,000 Free Miles! Citi AAdvantage Executive Card Holder? How About 2,000 Free Miles! Yesterday both my wife and I received emails from Citi thanking us for being Citi Executive cardholders. (No, thank you Citi! It has been rewarding.) Anyway, as a thank you each of us were given 2,000 bonus AAdvantage miles. After opening the email, I logged in to find that the miles were deposited in both of our accounts about a week ago! Both my wife and I have multiple AAdvantage Executive cards, however we each only received the 2,000 mile bonus once. Since the miles seem to have already been deposited, I suggest logging into your AAdvantage account to see if the Citi elf has left a present in your stocking! Happy Holidays! Previous articleSouthwest Credit Card Holder? Earn 2,000 Bonus Rapid Rewards Points For Dining & Shopping! Darn, none for me (yet). But glad you got yours! I didn’t receive anything yet. I wonder what the requirements are (unless they’re just rolling it out slowly).